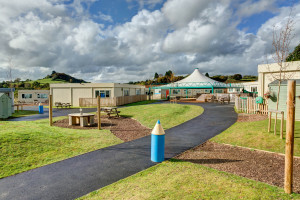 Portakabin, the UK’s leading supplier of interim modular buildings, has successfully constructed and handed over a complete new 300-pupil interim primary school in Devon in less than four months. Working in partnership with architects and project managers, Atkins, Portakabin provided more than 1,200sqm of primary teaching accommodation for the relocation of Dartington Primary School. The scheme will be in use for the next two years and was configured as 13 school buildings and three toilet blocks with disabled access. The project was delivered on time in a challenging timescale despite exceptionally high levels of rainfall during the programme, and the green field site immediately adjacent to the original school was highly constrained which made the building installation phase more complex. The modular buildings have been configured to create a village feel and a welcoming environment for children with imaginative age and function-related play zones. Facilities include a kitchen fitted out with the school’s own equipment, a music room, library, pre-school nursery, 11 classrooms, and an administrative building for the staff room, head teacher’s office, general offices, sick bay, toilets and school reception. The buildings arrived on site around 80 per cent fitted out, with partitions, plumbing and electrics pre-installed to reduce lead times. All internal fitting out was carried out by Portakabin and included provision of magnetic white boards for visual learning displays, access ramps, entrance canopies, and security and data communications. The provision of high quality interim teaching accommodation allows schools and LEAs to react quickly to local needs and to provide alternative facilities for pupils when it is necessary for building projects to continue during term time. By providing classrooms of the very highest standards and with a design life of at least 60 years, buildings from Portakabin help to ensure that there is no compromise on the quality of the learning environment. As at Dartington Primary School, the facilities can be configured and fitted out to the exact requirements of each individual school – as learning clusters, standalone teaching blocks and generously-sized, light, modern classrooms. The buildings can be linked to existing facilities; the floor area can be increased or reduced in line with local demographic needs, and the accommodation can remain in use for as long as needed. For further information about interim education buildings for primary and secondary schools, visit www.portakabin.co.uk, email information@portakabin.co.uk or call 0845 401 0010.